Moving your file from QuickBooks Desktop to QuickBooks Online? Here's a step-by-step guide to help you get it done. Wondering if you should convert from QuickBooks Desktop? You may want to review this Guide to Converting QuickBooks Desktop to QuickBooks Online before your start. You can only import QuickBooks Desktop data within the first 60 days of your QuickBooks Online company start date. When you import, your Desktop file will replace your Online file and overwrite any existing information. We suggest you keep your data file in QuickBooks Desktop and maintain your transactions on both sets of books until you determine QuickBooks Online is right for your business. Some information may not be imported when you move your file. Make sure you're aware of the import limitations and feature differences between QuickBooks Desktop and QuickBooks Online. If you are using a QuickBooks Desktop version older than 2016, download and install an updated trial, restore your company file, then use it for conversion. 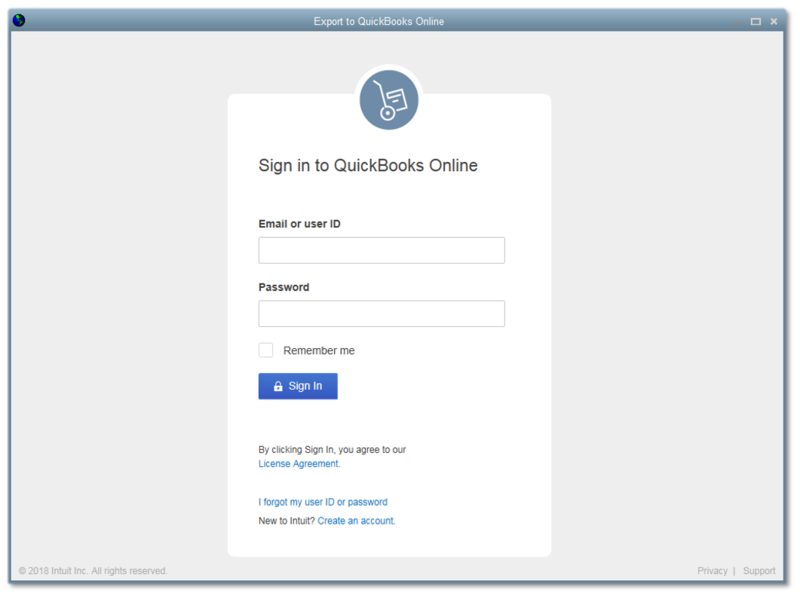 You must be logged in as the administrator in both your QuickBooks Desktop file and your QuickBooks Online account. 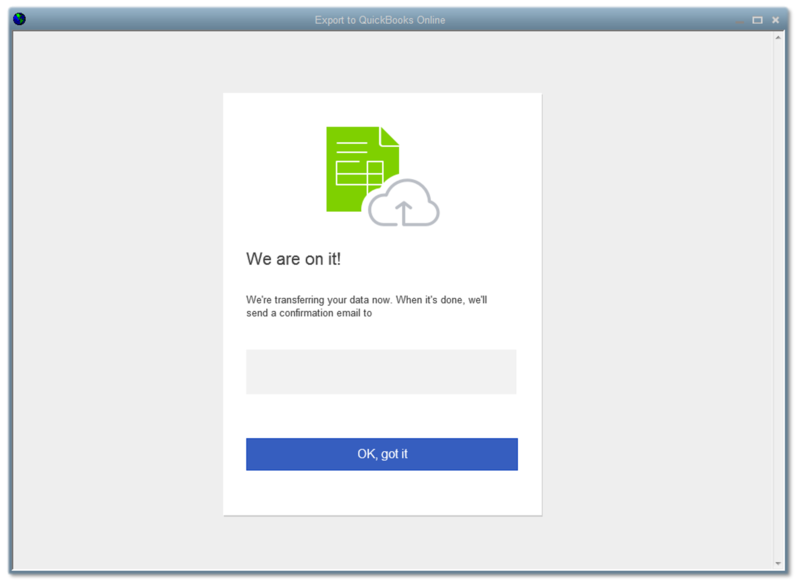 Start the conversion process from your QuickBooks Desktop company file, not from QuickBooks Online. If you've already turned on Payroll in QuickBooks Online, don't attempt to convert your file. Make sure all of your sales tax filings are current before migrating. You may need to make adjustment entries to sales tax filings after conversion. To be converted successfully, your QuickBooks file must not be over the target limit of 500, 000. To check, press Ctrl+1 on your keyboard, then look for Total Targets. If the file is over the target limit, you'll only be given the option to import your lists and/or balances when exporting. If you're over the limit, send your file to the Data Migration team. If you receive any errors while importing, you can fix errors when converting to QuickBooks Online. 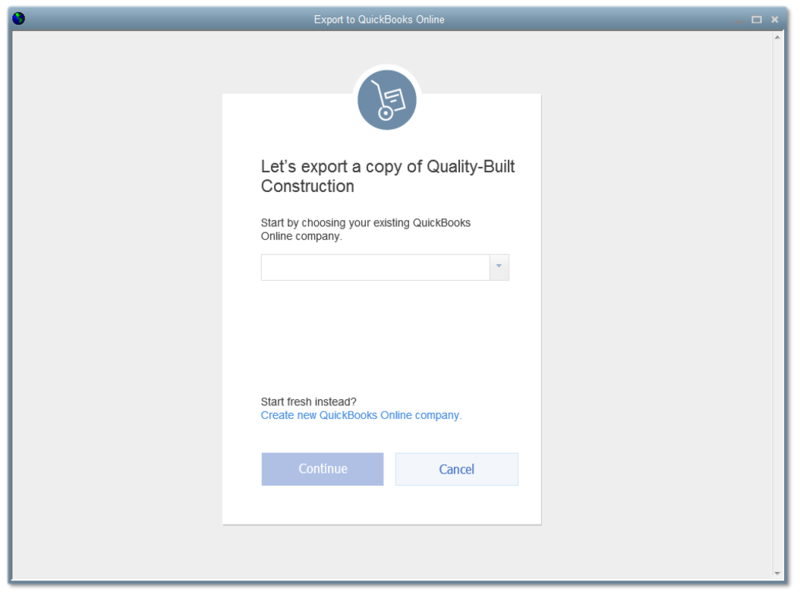 Select your QuickBooks Desktop version to see the instructions. Open the file you want to export. Go to Company > Export Company File to QuickBooks Online. Follow the prompts to connect to QuickBooks Online. Select all updates in the "Update Now" window, then Get Updates. Once the updates are complete, select Close, then File > Exit. Start QuickBooks again and finish installing the updates when prompted. These updates may take 15 minutes or more to install, depending on when QuickBooks was last updated. Important: If the updates are not downloaded and installed completely, the export company link may not appear. If you're unable to complete the updates, here are the steps to fixing QuickBooks Desktop update errors. 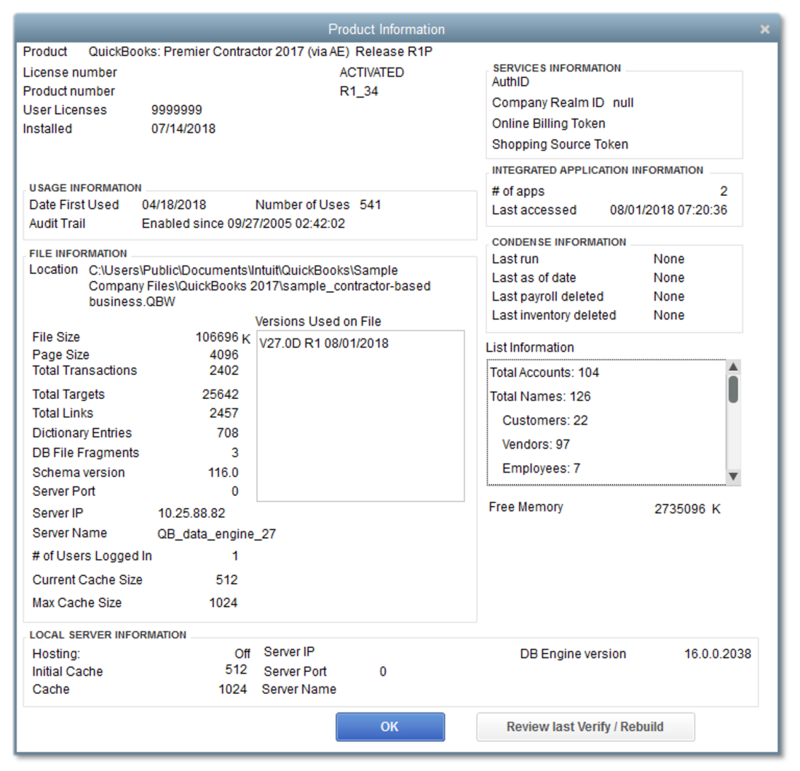 Are you an active user of the advanced features in QuickBooks Enterprise? If you are, we do not recommend moving your data from QuickBooks Desktop Enterprise to QuickBooks Online, because data loss is likely to occur. Take a test drive! Try QuickBooks Online using our sample companies. To determine if QuickBooks Online offers the features and functionalities you need, review the limitations of converting from Desktop to Online. Looking for online connectivity, but want to keep the advanced features of Enterprise? Consider hosting your QuickBooks Enterprise. On your keyboard, press Ctrl+1 to open the "Product Information" window. Press and hold Ctrl, then press B+Q. Select OK to close the Product Information. Note: If the sign-in window doesn't appear after closing Product Information, repeat steps 1-4. 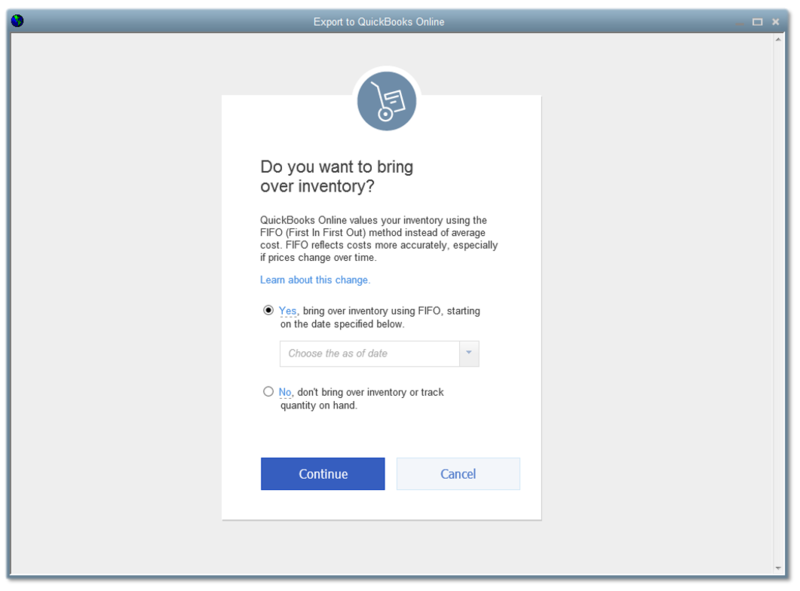 If you have inventory in your file and are importing from QuickBooks Desktop 2016 or later, you will see this screen, otherwise skip to step 3. Importing inventory? You'll need the Plus edition of QuickBooks Online. EasyStart and Essentials don't have inventory-tracking functionality. If you have extensive inventory, you can track your product items' quantity on hand in Plus . You’ll receive an email confirmation once the import is done. Note that it can take up to 24 hours.